Vijayadashmi, is considered the most auspicious day of the festival as it believed that on this day the demon was killed, denoting the victory of good over evil. It was then that the name of the city was supposedly derived from the demon's name. The months of September and October (and occasionally November as well) are filled with occasions and festivities. Adding to the list is the upcoming Mysore/Mysuru Dasara or commonly known as Dasara. Regarded as the state festival of Karnataka, this 10-day event is celebrated to commemorate the victory of Goddess Chamundeshwari of Chamundi Hill, who killed the buffalo-headed demon, Mahishasura. This year the Mysuru Dasara begins on 21 September and culminates on September 30. Popularly known as Navratri, this festival is perfect blend of history and culture and brings out the most beautiful aspect of the city. Grand processions, dance, music, torch parade and more are showcased during the nine-day celebration and on the 10th day (Vijayadashami), nine forms of the goddess are worshipped, which marks the end of the festival. Vijayadashmi is considered the most auspicious day of the festival as it believed that on this day the demon was killed denoting the victory of good over evil. It was then that the name of Mysuru (erstwhile Mysore) city was supposedly derived from demon, Mahishasura. On this occasion, the city of Mysuru is adorned with beautiful lights and decoration. 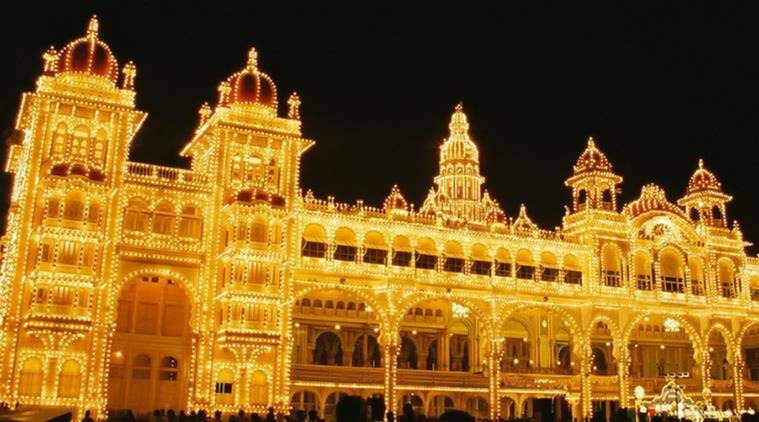 One of the main attraction of this festival is how elaborately the Mysore Palace lights up during this time. From the first day of the festival, the palace is illuminated with over 100,000 light bulbs lit from 7 pm to 10 pm till the last day. An approximate expenditure of 10 million is involved in just the maintenance of this lighting. The people of Mysuru come together and celebrate this tradition with zeal and enthusiasm, which over a period of time has attracted a large audience including foreigners. 1 When is Durga Puja? 2 When is Eid al-Adha 2017? 3 When is Onam in 2017?